2013 Baumer Cup - Grueling 3-set match held at Pebble Beach Tennis Club in Monterey, CA. JT and Nathan versus Brothers Requiro. 2013 Baumer Cup has officially begun! The 2013 Baumer Cup Championships are currently underway! 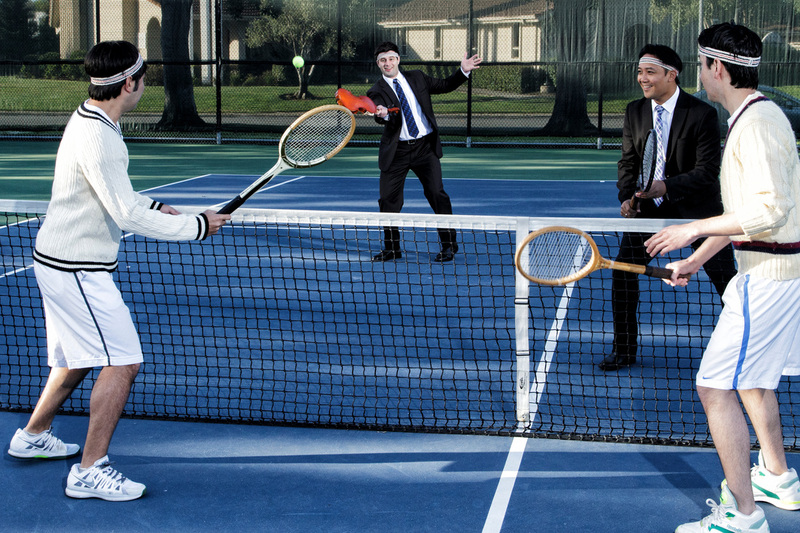 It is an annual series of round robin tennis tournaments that centers around the gentleman's game of tennis. 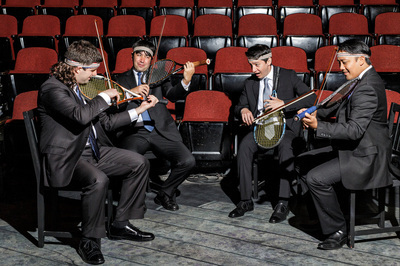 Competition is fierce among the members of the Baumer String Quartet. 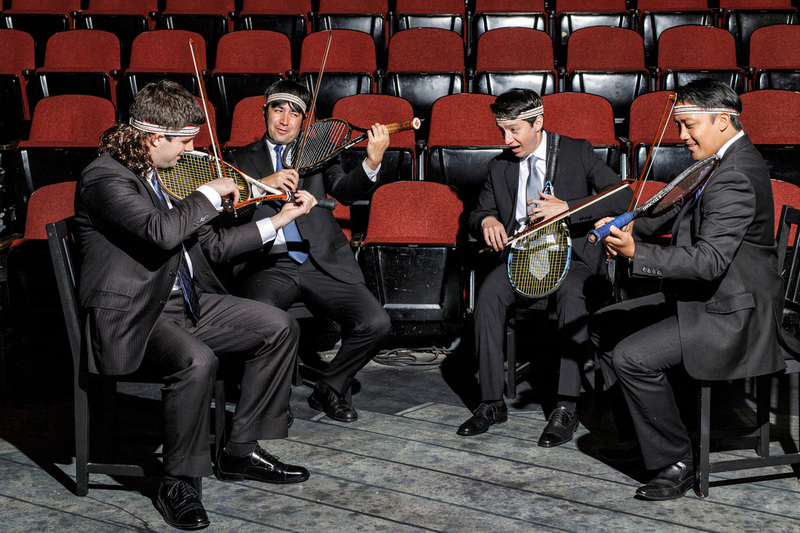 Equally at home on the tennis court as they are in the concert hall, each member of the quartet is an accomplished tennis player. For instance, Aaron has been a member of numerous tennis teams and has won tennis tournaments. To this day, he proudly displays the many tennis trophies in his childhood bedroom much to the chagrin of the other members. David, too, has won a few tennis tournaments in his day and was instrumental in helping secure Team CIM (Cleveland Institute of Music's intramural sports team) the 2004-2005 CIM/Case Western Reserve University Intramural Sports Tennis Championship. 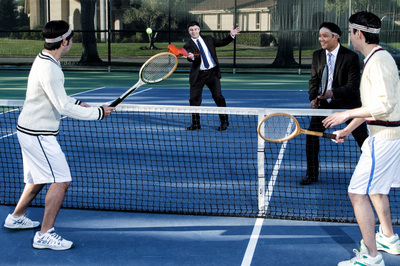 Nathan is an avid tennis player and is currently pursuing his interest in racquetball. JT is also an avid tennis player and is a current member of the USTA-Florida chapter. The first stage of the Baumer Cup took place in Monterey/Carmel, California, from June 9-23. Stage two will take place in Berkeley/Oakland, CA, from July 5-14. Stage three will take place from October 1-6 in Oakland, CA. Check in with us early and often for the results! We'll make sure to post them up here in the near future. For now, you'll have to befriend Aaron on facebook and check out the current results on his page. If we remember, we'll post when our matches will be played. Come check us out and experience the thrill of victory and the agony of defeat with BaumerSQ! If you miss us, then you might be able to catch us after the match for a delicious spinach and mushroom pizza at Zachary's Chicago Pizza in Oakland. You might find Nathan at the Cheeseboard in Berkeley. Three hard fought matches that I can recall. Nobody left unscathed, as we all lost at least one match apiece. The biggest match of the season ended with a gripping 6-4, 5-7, 9-7 (3rd set tie break) victory for the Brothers Requiro over Team House Guests (JT and Nathan). Victory never tasted sweeter for Aaron, as he and his brother avoided an upset of epic proportions on th e evening of Aaron's birthday! After a well deserved (perhaps firmer than normal?) handshake, the BaumerSQ enjoyed a post-match pizza party at the Ivanhoe Palace, courtesy of Zachary's Chicago Pizza.